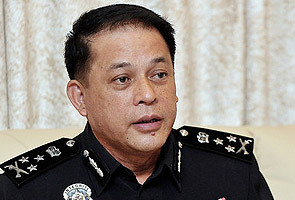 Deputy Inspector-General of Police, Datuk Seri Mohd Bakri Mohd Zinin has urged all quarters to refrain from being extreme when discussing religious and racial issues as this could disrupt harmony in the country. With regard to religious issues, he said they should leave it to the religious authorities to take appropriate action in order to preserve harmony. "Many countries have resulted in turmoil due to disputes between people over religious and racial issues. We don't want this to happen in Malaysia," he said after delivering a message in conjunction with an ex-policemen's gathering and remembrance of the attack on the Bukit Kepong police station during the Malayan Emergency Period, here. He said this in reference to a woman, purportedly from the East Coast, who questioned the power of Allah through her Facebook account last week. To another question from reporters, Mohd Bakri said police had so far not received any report on the Facebook posting by the woman who was believed to be overseas. Earlier, in his speech, he said RM1.5 million had been spent on renovating the Bukit Kepong police station, and another RM13.5 million would be spent on building a three-storey complex which would house, among others, the Bukit Kepong Museum which was expected to be ready in November this year. Also present at the function, were former inspector-general of police Tun Haniff Omar and Johor police chief Datuk Mohd Mokhtar Mohd Shariff.